Starting in the summer of 2017, Latino Splash Camp has served more than 70 kids by teaching them how to swim. 9 of those children even gained the skills needed to join the swim team and are now entering their 3rd competitive swim season. Bozeman Dentistry is proud to sponsor this noble cause. 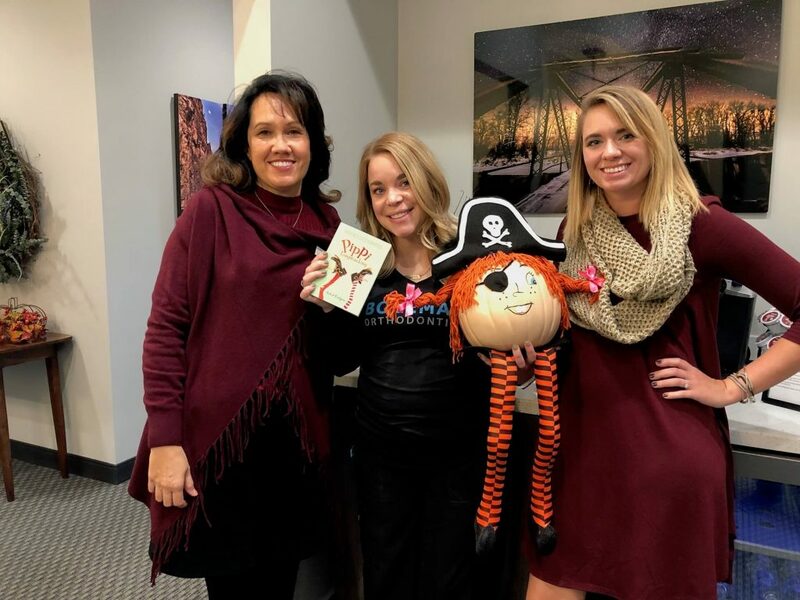 Bozeman Orthodontics challenged local dental offices to enter a pumpkin decorating contest. 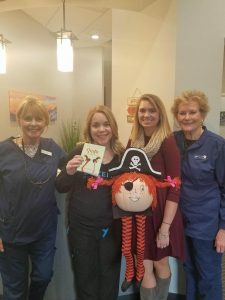 Dental offices were asked to purchase a children’s book and decorate a pumpkin to match the book. The pumpkins will be judged and the winning office will be treated to dinner at a restaurant of the winner’s choice. The books will be donated to Meadowlark Elementary School. 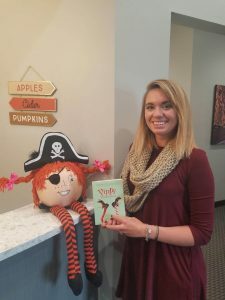 We entered a pumpkin that was creatively decorated by our Financial Coordinator, Stephanie. 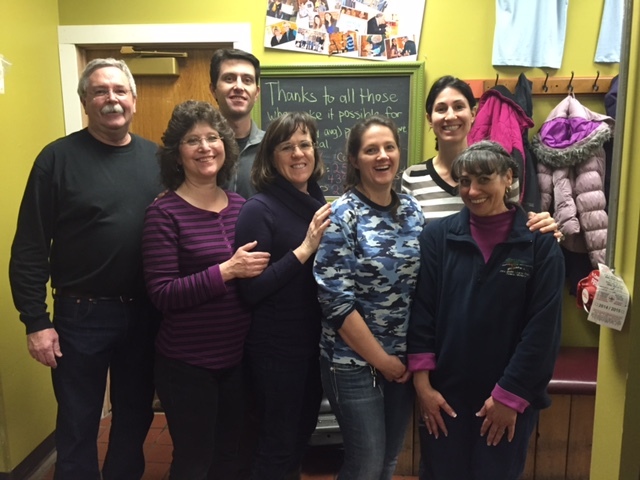 In the photos are members of our staff with Bozeman Orthodontics staff member BreAnna. Nov. 2017: Bozeman Dentistry was proud to be a collection site for Can the Griz. 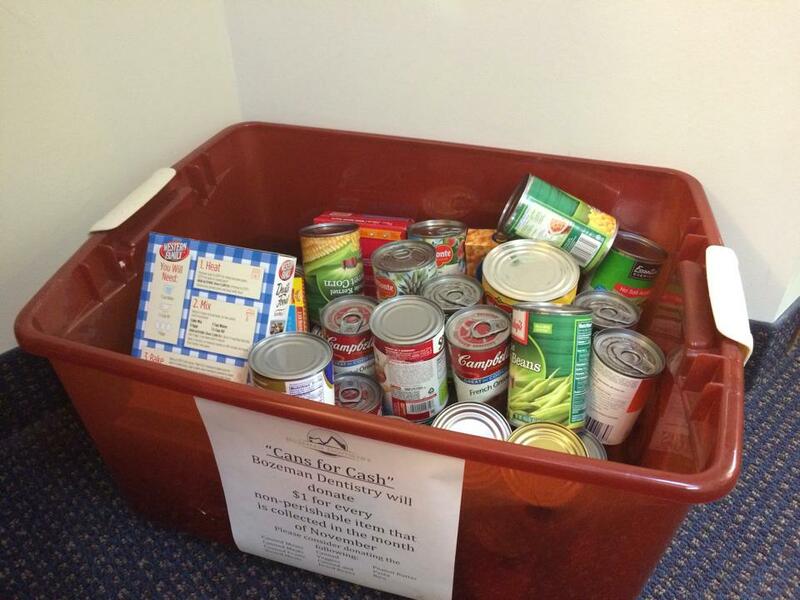 We were a part of a record amount donated to the Gallatin County Food Bank – 389,093 pounds of food and financial donations. 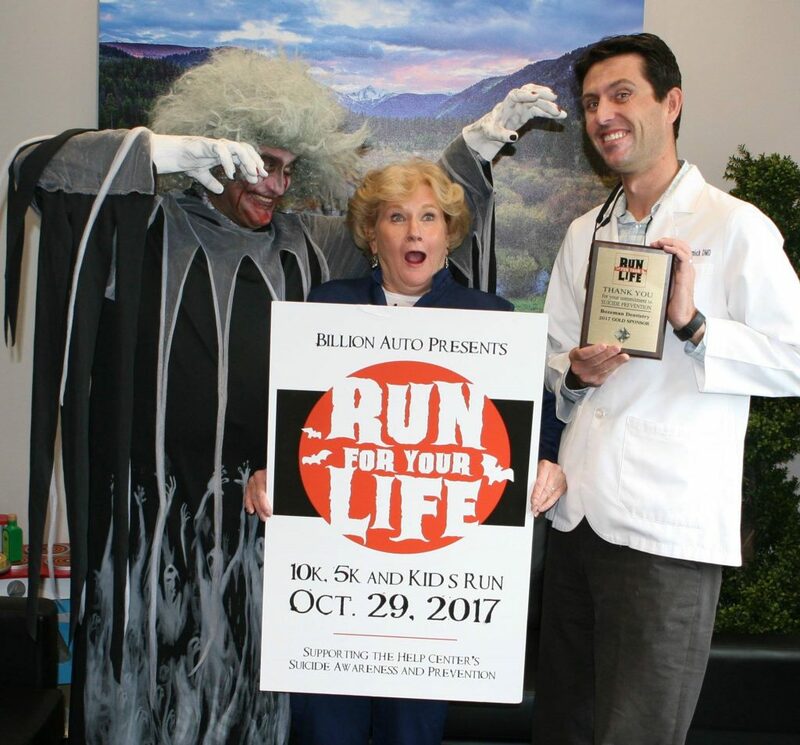 We were proud to increase to a Gold level sponsorship of the Help Center’s “Run For Your Life”. The staff joined in to run/walk together on Oct. 29th! 🙂 This even is an important opportunity to support Suicide Prevention in Gallatin Co. and the surrounding 13 counties. Bozeman Dentistry was a sponsor of this event, several staff ran to support the cause, Dr. McCormick was the volunteer photographer for the event, and his wife was the race director. 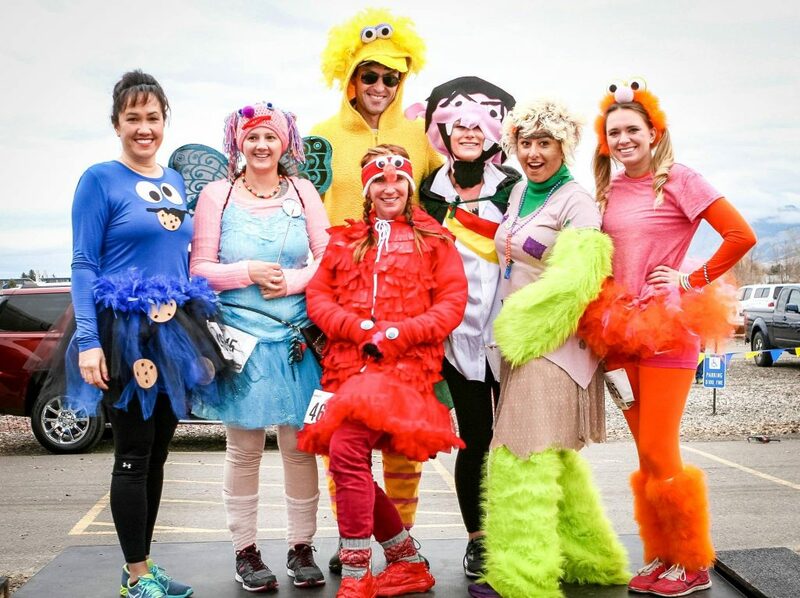 The Help Center’s “Run For Your Life” 5k fundraiser in Bozeman last weekend attracted nearly twice as many racers as it did in 2015 — from 467 to 870 — and raised over $40,000 thanks to the leadership of Flora McCormick. McCormick, 36, is vice-chair of the center’s board of directors. The Help Center is a 24-hour crisis hotline and referral service that works on suicide prevention and intervention. “I feel so fortunate. 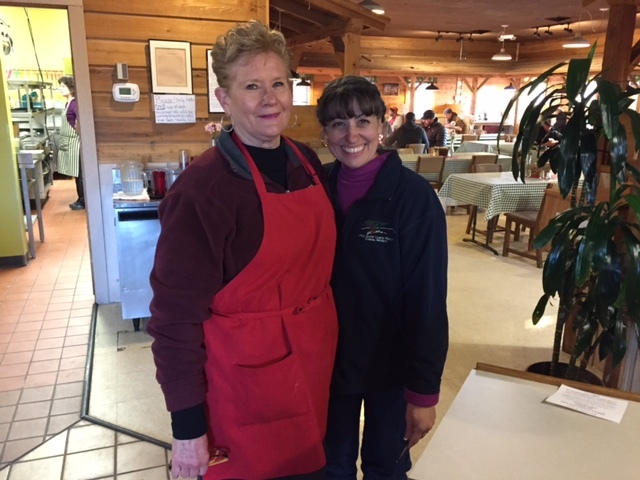 It gives me so much seeing people connect,” McCormick said. The professional counselor and her husband, a dentist, moved to Bozeman from Missoula five years ago. 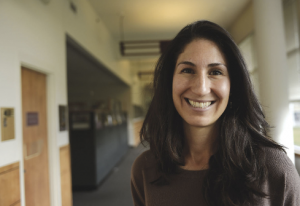 Knowing few people in her new community, McCormick began networking to grow her client list. She joined and became president of the Bozeman Business and Professional Women and volunteered four hours a week for the next two years at the Help Center, taking calls on the crisis hotline. After her first child was born — she now has two kids — McCormick became a stay-at-home mom, but she also decided to still work for the Help Center, leaving the hotline to join the board. 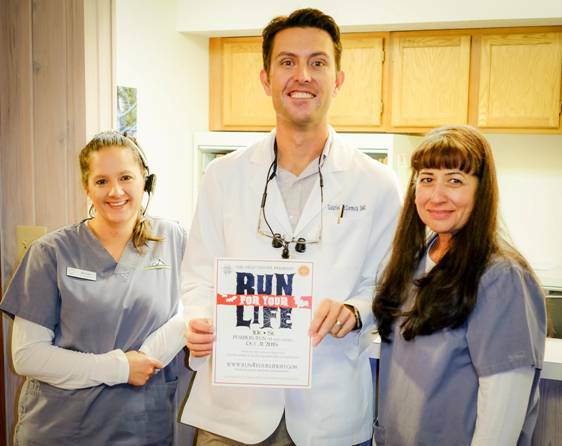 Bozeman Dentistry was a proud sponsor of the 2015 Run For Your Life, to benefit the Help Center. The run promoted suicide prevention and awareness. Sadly, Montana has the highest suicide rate in the nation. Thankfully, this local organization provides suicide and crisis counseling via a confidential hotline 24/7. 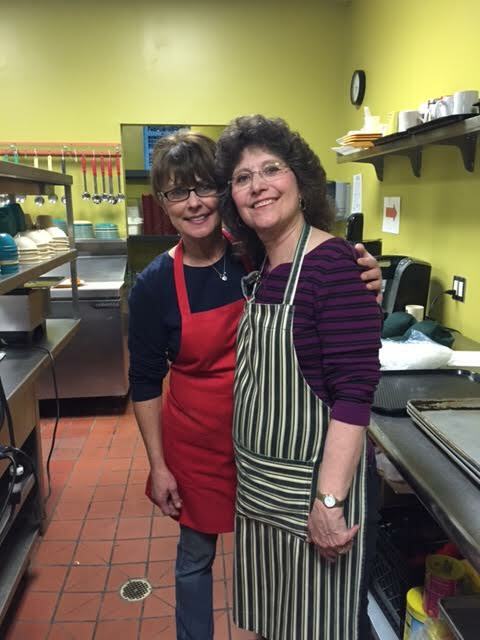 They also provide several other crucial social services for Gallatin County and the surrounding 13 counties. 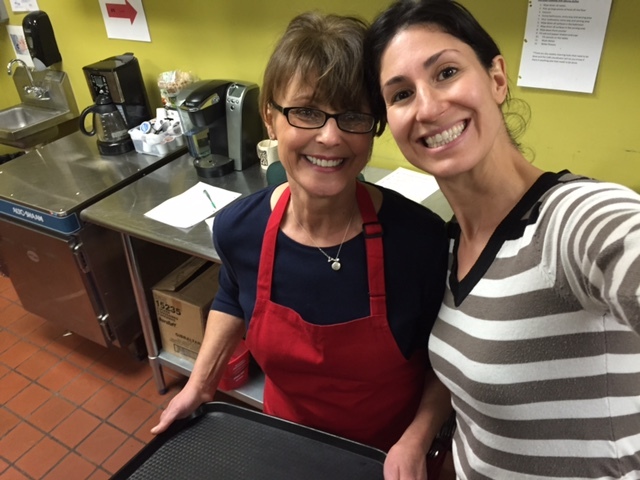 Dr. McCormick’s wife served as a volunteer on the hotline for two years and now serves on the Help Center’s Board of Directors. 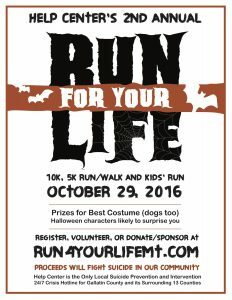 She was proud to serve as this year’s race director for Run For Your Life.